On Core Crew, Home Brew, and Winning, Too! 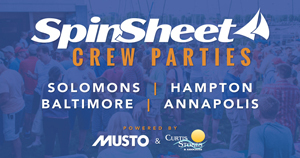 There’s something special about the start of sailing season in Annapolis, and attendees at the annual Annapolis Spring Sailboat Show can really feel the excitement building. Mooring anxiety? Planning, gathering your thoughts, and asking questions will help you overcome your mooring, docking, and anchoring stress while chartering a sailboat.